Set to retire this off-season, Chris Carpenter will go down as one of the best postseason pitchers in the history of baseball. There are numerous articles written about his postseason legacy, but this one by HardballTalk in 2011 is one of the absolute best. Carpenter made 18 postseason starts–compiling a 10-4 record with a 3.00 ERA. His last postseason, one in which he pitched while injured, put a slight damper on these numbers, but it also added to his legend. Carpenter was just the second pitcher in MLB history (the other being Virgil Trucks in 1945) to record a postseason win without having one in the regular season. Well, 22-year-old rookie, Michael Wacha, is making his case to drive Carpenter’s numbers into the ground. Through four postseason starts, in his rookie season nonetheless, Wacha is 4-0 with a 1.00 ERA. For perspective, Carpenter didn’t make his first postseason start until his eighth year in the MLB at the age of 30–eight years older than Wacha. Carpenter after his first four starts? 3-0 with a 1.98 ERA. Thus, Wacha has one more win and has an ERA almost one point lower than Carpenter’s over their first four postseason starts. However, this does not even tell the whole story. Over those four starts, Carpenter allowed 22 hits–Wacha has allowed exactly half that with 11. Opponents hit .229 against Carpenter and have hit just .122 against Wacha. Carpenter had 19 strikeouts and 8 walks. Wacha has 28 strikeouts and 8 walks. For even more perspective, I decided to look at Bob Gibson‘s first four postseason starts–all in the World Series since they did not have the same playoff format back then–as well. Gibson was 3-1 with a 2.50 ERA. He had 41 strikeouts and 9 walks. Opponents hit .218 against him–96 points higher than the batting average against Wacha thus far. Yet, unlike both Carpenter and Wacha, Gibson had 36 innings pitched over these four starts–8 IP in his first start, 10 IP in his second, 9 IP in his third, and 9 IP in his fourth. Interested in seeing the rest of Gibson’s amazing postseason statistics? Click HERE. Michael Wacha is in really good company to even be talked about in the same sentence as Bob Gibson and Chris Carpenter. Will he ever be as good as Gibson? Absolutely not. Gibson is in a class of his own and will forever be known as one of the best pitchers in the game. He, too, would have had gaudy win totals if he had played under the current playoff format. However, given Wacha’s early start in the playoffs, since it is still his rookie season, and the fact that the Cardinals appear to be built to make the playoffs for years to come, Wacha has a really good chance at eclipsing Carpenter’s numbers early in his career and creating his own records as his career progresses. Buckle up, Cardinal fans, the World Series is on the line–at Fenway Park. Game 6 is necessary after the Cardinals lost two of three at Busch Stadium. 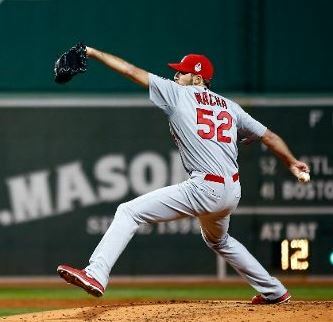 Wacha will be poised and ready to compete for his 5th playoff win and keep the Cardinals World Series title hopes alive. Have you enjoyed watching the 22-year-old Carlos Martinez pitch so far in the postseason? I know I have. There aren’t many other young arms with more electric stuff than Martinez–or “Baby Pedro” as many people call him. Martinez throws two types of fastballs–the four-seamer and the two-seamer/sinker. His four-seam fastball has averaged 99.53 MPH with 5.04 inches of horizontal (tailing) movement in the playoffs. His two-seam fastball has averaged 97.06 MPH with an incredible 8.64 inches of horizontal (tailing) movement–that’s over half of the width of home plate! Finally, the devastating slider that he broke off a couple of times in Game 2 of the World Series–83.73 MPH with 8.07 inches of snapping movement across the plate, away from right-handed hitters. This amount of movement, combined with his overpowering velocity and ability to change speeds, is almost unfair on hitters. In short, his stuff is absolutely filthy. Well, to be frank, St. Louis is pretty lucky to even have him on the roster, and Boston fans must be cringing every single time they see him succeed on the mound–especially against their team in the World Series. Back in 2009, when Martinez was only 17 years old, he was signed by the Boston Red Sox. At that time, he was signed by the name of Carlos Matias. 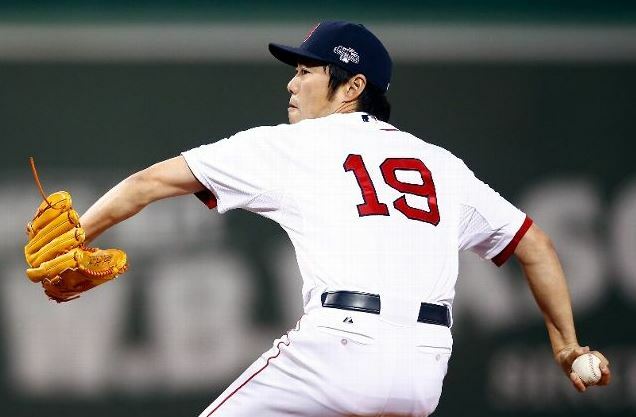 Rumors have it that the Red Sox signed him for less than $200,000–a steal given his supreme talent. However, just a few weeks into his professional career, an investigation transpired. Consistent with all international signees, the MLB ran a background check and found out that Carlos Matias was actually Carlos Martinez, and because of this, his contract with the Red Sox was null and void. Martinez was suspended from baseball for one year, and it was during this time that he continued to develop his electric fastball–creating a buzz around organizations throughout the league. 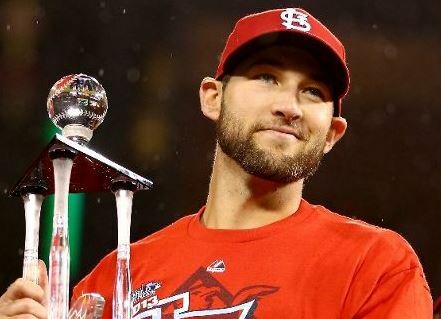 When his suspension expired in 2010, the Cardinals jumped on the opportunity–signing the young right-hander for a reported $1.5 million signing bonus, and the rest is history. Just three years after his signing, Martinez is playing a key role in the success of the Cardinals. Is Martinez’s future in the starting rotation or at the back of the bullpen? That is yet to be seen, but let’s enjoy his electric stuff in the seventh and/or eighth inning(s) for the rest of the World Series. I anticipate the remaining games to be close like Game 2. Given Matheny’s confidence in the rookie, Martinez will play a key role in determining whether or not the Cardinals can take home their 12th World Series title. This was just a brief breakdown of the situation, mainly from a Cardinals perspective. If you would like a Boston perspective, the Full Count blog, part of the WEEI.com Network, has a great piece you can check out as well. The St. Louis Cardinals got blown out by the Boston Red Sox in Game 1 of the World Series–losing 8-1 despite having their ace, Adam Wainwright, on the mound. A costly miscue by Pete Kozma in the first inning when trying to turn a double play ball set the tone for the Cardinals, and the Red Sox took full advantage. The Cardinal defense, though it is known for its poor range, is usually sure-handed on balls hit right at the fielders. Last night, this was definitely not the case, but that is as far as I want to get into that discussion. Arguably the best starting pitcher in the playoffs, 22-year-old rookie right-hander, Michael Wacha, takes the hill for the Cardinals in Game 2. His playoff statistics are nearly flawless thus far. In three starts, he has 21.0 innings pitched and has allowed only one earned run (0.43 ERA)–a solo home run that broke up his no-hitter against the Pirates in the NLDS. He has a perfect 3-0 record with 22 strikeouts and just 4 walks. Oh, and he out-dueled Clayton Kershaw twice in the NLCS–not a big deal, though, right? Needless to say, Wacha has been on fire in the playoffs. He edged out Carlos Beltran for the NLCS MVP, even though both would have been quite deserving of it. Well, as I explained in the following post, one of Wacha’s best pitches is his changeup. And again in this post, I said that the Cardinals would “ride Wacha’s changeup” back to St. Louis before his start in Game 4 of the NLDS. Thus, once again, the matchup is favorable for the young rookie right-hander. He does not really have to change his approach in order to have success against the Red Sox, which can be huge for a pitcher that is in such a groove. Obviously, they will have watched game film of him, so slight adjustments must be made, but nothing too drastic considering the majority of them have struggled against arguably his best pitch over the course of an entire season. This best pitch, like his overall performance, is on fire as well. According to ESPNBoston, hitters have a .093 batting average against his changeup since September 19th. Wow! Wacha knows this, and he has been throwing it much more–almost 24% of the time in his three playoff starts. When facing Pedroia, who hits the changeup relatively well, I would like to see Wacha give him a heavy dose of fastballs. Pedroia is a really good hitter, but hitting fastballs, according to the numbers, is not one of the best pitches he hits against. Regarding Ortiz, he seems to hit every single pitch well, so Wacha will just have to be extremely careful and pick his spots with him. An advantage for Wacha is that this will be the first time Ortiz has faced him, so it may take a few at-bats before he can adjust to the plane of his pitches. We all know how good his fastball is, how good his changeup is, and how difficult it is to distinguish between the two at the plate (something I have harped on numerous times in the past), but I honestly believe the wild card in Game 2 will be his curveball. He has proven in the past, like in his near no-hitter against the Washington Nationals, that he does not necessarily need it all that much. With more and more game film, hitters, especially good hitters like the ones in Boston, will start making adjustments to his fastball-changeup combination. Wacha knows this as well and has actually had a pretty good curveball throughout the playoffs. I wrote in my very first post on Wacha that a scout said his curveball had a chance to resemble Wainwright’s some day, and we have seen glimpses of this lately. He has been throwing it more often as well–almost 13% of the time in the playoffs. Well, the stage is set. The rookie right-hander is on the mound for the Cardinals in a pivotal Game 2 of the World Series. It is essentially a must-win for the Cardinals–not only because they do not want to be down two games to zero, but because going down two games to zero with your best pitchers on the mound can be extremely disheartening. Well, Mr. Michael Wacha, Cardinal Nation is really excited about it, too. Go out there and do your thing! The St. Louis Cardinals versus the Los Angeles Dodgers. Homegrown talent versus a “store-bought” product. Game 6 of the NLCS. The scoreboard read 0-0 with one out in the bottom of the third inning. Unable to score in the prior two innings with a runner in scoring position, St. Louis fans, those at the stadium as well as the ones at home, were getting restless. Was this really happening again? Would they really have endure yet another heart-stopping Game 7? The Birds on the Bat wouldn’t relinquish another 3-1 NLCS lead, now would they? Well, on the mound was the best pitcher on the planet, Clayton Kershaw, and at the plate was arguably the 2013 Cardinal MVP, Matt Carpenter. So, the scene was set. It was time for a heavy-weight battle that will forever be remembered as “The At-Bat” for Cardinal fans throughout the nation. Kershaw fired 7 fastballs that averaged 93.2 MPH, slung 3 sliders that averaged 4.71 inches of break, and broke off 1 curveball that had 7.54 inches of drop to it. A devastating sequence of pitches from the future Hall-of-Famer. 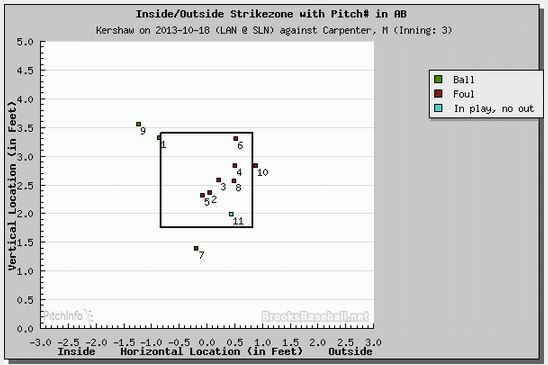 Yet, Carpenter warded off the blows from Kershaw by fouling off 8 of the 11 pitches–deliberately setting up his counter-move. On the 11th pitch, Carpenter delivered his signature knockout blow–a double into the right field corner on a nasty slider down and away in the zone. There you have it. THE At-Bat. Nope, no runs scored on the play. The scoreboard still read 0-0 as Carlos Beltran walked up to the plate. Yet, this will go down as one of the most pivotal moments of the entire 2013 NLCS. Kershaw was rattled. The almighty Kershaw was knocked off his line by Carpenter’s tremendous at-bat. He had just barely evaded damage in the first and second innings, but Carpenter made sure that this would not repeat in the third inning as well. The rest is history, and it can be read in game recaps all over the internet, but I will highlight some key points. The Cardinal offense made an extraordinary pitcher look rather ordinary when it mattered most. Beltran, doing what he does best, scorched a liner past Mark Ellis at second to score Carpenter–1-0. This would have been enough for the future NLCS MVP, Michael Wacha, but the team did not stop there. Yadier Molina made up for his Game 5 woes, knocking in Beltran on a hanging breaking ball. Shane Robinson then came up with the bases loaded and knocked in two runners himself. At the end of the third inning, the Cardinals led the Dodgers 4 to 0. They had batted all the way around the order while recording 5 hits and 4 runs. The Cardinals will now travel to either Boston or Detroit for the World Series with their ace, Adam Wainwright, on the hill for Game 1. Clayton Kershaw is the best pitcher on the planet right now. He is the clear front-runner for his second NL Cy Young Award in just three seasons. He led the MLB in numerous categories–most notably pitcher WAR (6.5) and ERA (1.83). Well, with the St. Louis Cardinals’ NLCS lead down to just one game going into the pivotal Game 6, I decided to look deeper into Kershaw’s numbers to see if I could find any possible trends that the Cardinal offense could exploit on Friday night at Busch Stadium. As you can see, regardless of what side of the plate the hitter is on, Kershaw likes to start out at-bats with his fastball. If he falls behind in the count, he throws his fastball. When the count is even, he still throws his fastball the majority of the time. In short, it is safe to say that he is predominantly a fastball pitcher. His fastball is not overpowering anymore (93.4 MPH on average) and is of the four-seam variety so it does not have very much movement. Thus, he relies on his pinpoint control to get hitters out. Well, if you are constructing a lineup to best succeed against a fastball pitcher like Kershaw, wouldn’t you want your best fastball hitters in the lineup? I know that he is a left-handed pitcher, but a four-seam fastball is a four-seam fastball no matter which arm throws it since it has very little movement to it–his moves on average just 0.89 inches horizontally. A quick side note for the Cardinals, if they have two strikes against Kershaw, there is really no need to be worried about his changeup. Based on the numbers, he did not throw a single changeup with two strikes in all of 2013. Thus, if the ball looks straight out of his hand, it will likely be a fastball. Sure, he probably knows this and could pull a changeup out of his back pocket, but the Cardinals have to to look for whatever advantage they can possibly get when facing a future Hall-of-Fame pitcher like Kershaw. Well, the fact that he is fastball pitcher is good news for the Cardinals. Their lineup is full of fastball hitters. 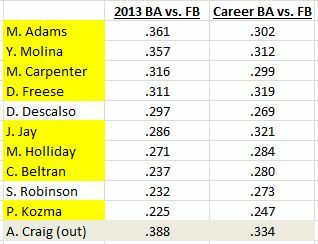 To be honest, this is likely why the Cardinals have had some success against him so far in 2013 and throughout his career. He is 4-5 with a 3.75 ERA against St. Louis–his highest ERA against any team in the National League. At Busch Stadium in particular, he is 2-3 with a 3.65 ERA. Matt Adams and Yadier Molina have “torn the cover off the ball” against fastballs in 2013–hitting .361 and 357 respectively. 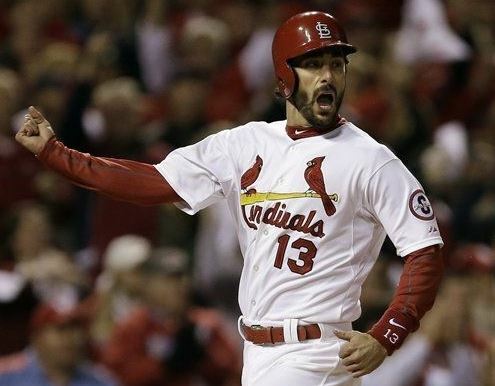 Matt Carpenter and David Freese aren’t too shabby themselves–Carpenter at .316 and Freese at .311. Carpenter will obviously be in the lineup batting leadoff, and I think Freese should be, too, regardless of his recent struggles at the plate. Descalso has had most of his success (.297) against the fastball this year as well, but his defense at shortstop is just not good enough to warrant a start in Game 6. Carlos Beltran and Matt Holliday have not been the best against fastballs this season, but their veteran presence combined with their ability to hit the long ball makes them locks for every game in the playoffs. Finally, the Jon Jay versus Shane Robinson argument that has been all over social media since Jay’s costly defensive lapses in Game 3 of the NLCS. Well, as the data shows, Jay is a much better fastball hitter than Robinson–.286 to .232 in 2013 and .321 to .273 in their careers. But, what about Jay’s arm? Yeah, Jay’s arm is weak, but I broke down the numbers to see just how bad it was compared to Robinson’s, and this is where it got a little interesting. Jay gets one outfield assist every 258 innings. This is not very good at all. However, Robinson is not that much better–recording one outfield assist every 243 innings. Thus, Jay’s arm is not very good, but statistically-speaking, Robinson’s is not much of an improvement. What about range? Clearly, Robinson has more range than Jay, but is this enough to start him over Jay when his offense, especially against the fastball, is inferior? In my opinion, it is not. UPDATE (5:00 PM 10-18): Shane Robinson will be starting in center for the Cardinals and will be batting seventh. Even though I am quite the Jay supporter, I can understand this move. If it helps the Cardinals reach the World Series tonight, then I am all for it. Should Matheny shuffle the order around against Kershaw? Sure, it couldn’t hurt, but should he replace proven fastball hitters with unproven hitters in attempt to ignite the team? No. In my opinion, based on the numbers, the players highlighted in yellow should be in the starting lineup for the Cardinals. The order in which they hit? I will leave that up to Matheny to decide. In the NLCS, the overall problem for the Cardinals has been the offense (2.4 runs per game), not the defense. This is why it is in the team’s best interest to have their best fastball hitters in the lineup versus Kershaw. Kershaw has allowed only 11 home runs in all of 2013 and has not allowed one since September 8th (40 days ago)–when Jay Bruce crushed two against him–both on hanging sliders up and over the middle of the plate. Unfortunately for the Cardinals, the only player with a home run against Kershaw is Allen Craig, but this just means the rest of them are due for one, right? Well, of the 11 homeruns he allowed, eight of them came against right-handed hitters, two against left-handed hitters, and one against a switch hitter (who obviously batted right-handed against the left-handed Kershaw). Seven of them came off his fastball and four off his slider. 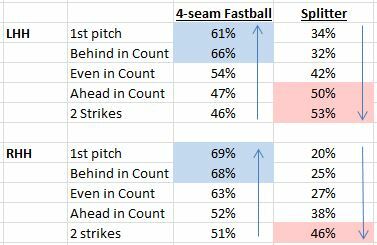 The most common sequence that resulted in a home run was a four-pitch sequence–fastball, fastball, slider, fastball–occurring on four of the 11 (36.4%) home runs. 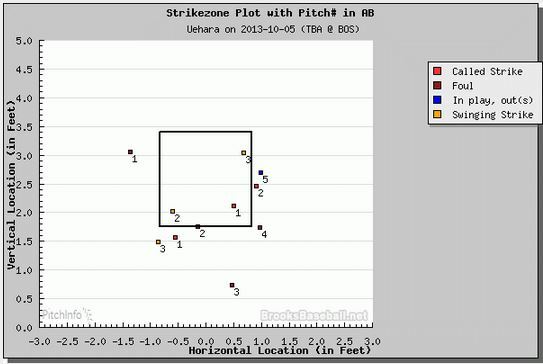 Finally, only one of the 11 homeruns came on a pitch low in the zone. 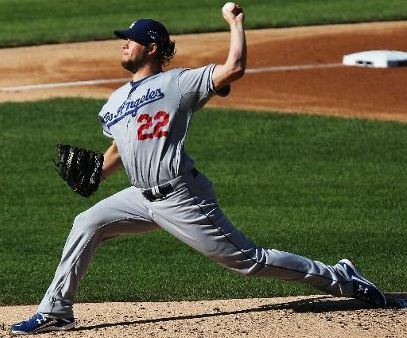 I do not advocate swinging for the fences–especially with the type of offense St. Louis has and the pitcher Kershaw is–but if they truly feel the need, they should probably only do so on pitches in the middle or upper parts of the zone. For 2013, hitters are swinging at 33.1% of Kershaw’s pitches that are out of the strike zone. The Cardinals need this swing percentage to be much lower if they want to have continued success against him and move on to the World Series. What I am basically saying is that when he does throw a ball–he does not throw many–do not swing at it. If the pitch looks nasty out of his hand, you are better off not swinging because it will likely dip out of the strike zone, and if it doesn’t, you likely had no chance of making solid contact anyways. Why is this a big deal? The table below explains why. He is nearly un-hittable when ahead in the count; while he is much more hittable when behind in the count. Sure, Kershaw is the type of pitcher that dictates the count, especially when he is in a groove, but the Cardinals cannot make it easy on him and must avoid expanded their zones early in counts and early in the game. In 2013, opponents are hitting .373 (22 hits in 59 ABs) with two doubles and one homerun on a 1-1 count. Opponents are hitting .364 (12 hits in 33 ABs) with a triple and four home runs on a 2-1 count. The Cardinal offense is in for a late-October treat on Friday night (pending the weather obviously). Beating a Cy Young and future Hall-of-Fame pitcher four times in a row in one season would be quite the feat. The fact that the game is being played in St. Louis will be a huge advantage–they are hitting .274 at Busch Stadium while only .221 at Dodger Stadium. I really do hope the weather holds off or they wait until Saturday to play the game because it would be a shame to waste a pitching match-up like this one for a possible series-clinching game. Kershaw could very well dictate the pace by pumping in strike after strike after strike in Game 6. However, until he proves that he will throw pitches in the strike zone, the offense needs to bring an approach similar to the one they used in Game 3 of the NLDS against Francisco Liriano–working the count by not expanding their zone. Also, unless there are two strikes in the count, I would likely lay off all of his breaking pitches considering opponents are hitting a combined .150 on his curveball and slider in 2013. Make sure to also check out @hardballnews and @KSDKSports for more baseball news as well! The Cardinals lost to the Dodgers 3-0 on Monday night–trimming their National League Championship Series lead to just two games to one. The bats remained silent, the defense (Jon Jay‘s in particular) had some glaring miscues, and there was a rally-killing mental lapse by Daniel Descalso on the base-paths in the 5th inning. However, I will not harp on any of these because I have already read enough about them, and I am sure you have as well. Thus, I have decided to focus on the one major positive from Monday night–Adam Wainwright‘s fantastic outing on the mound. What goes down as a loss in the box score was actually an ace-like performance from Wainwright and the the third straight quality start by Cardinals in the NLCS. The final line for Wainwright in Game 3 looks like this: 7.0 innings pitched, 6 hits allowed, 2 earned runs, and 5 strikeouts. Yet, Wainwright deserved much better than this–particularly in the “hits allowed” and “earned run” categories–and the reasoning for this was already mentioned in my opening paragraph. 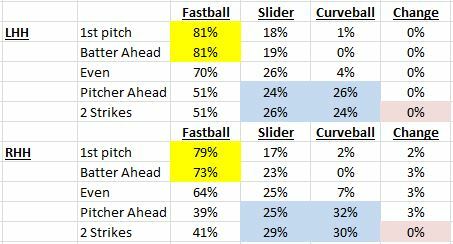 I had noticed a trend in his pitching style this season, so I decided to manually break down every single pitch that he threw in the game to see if the data backed up my theory. 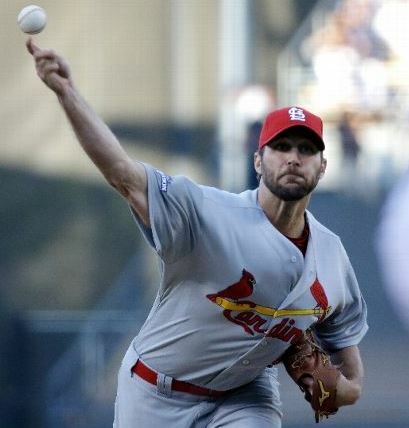 By my count, Wainwright threw 33 curveballs, 30 cutters, 27 fastballs, and only one changeup. As most of you already know, I use BrooksBaseball.net for much of my pitching data, but this time, I wanted to chart his pitching manually to check the accuracy of the site since I have had people come to me with doubts in the past. 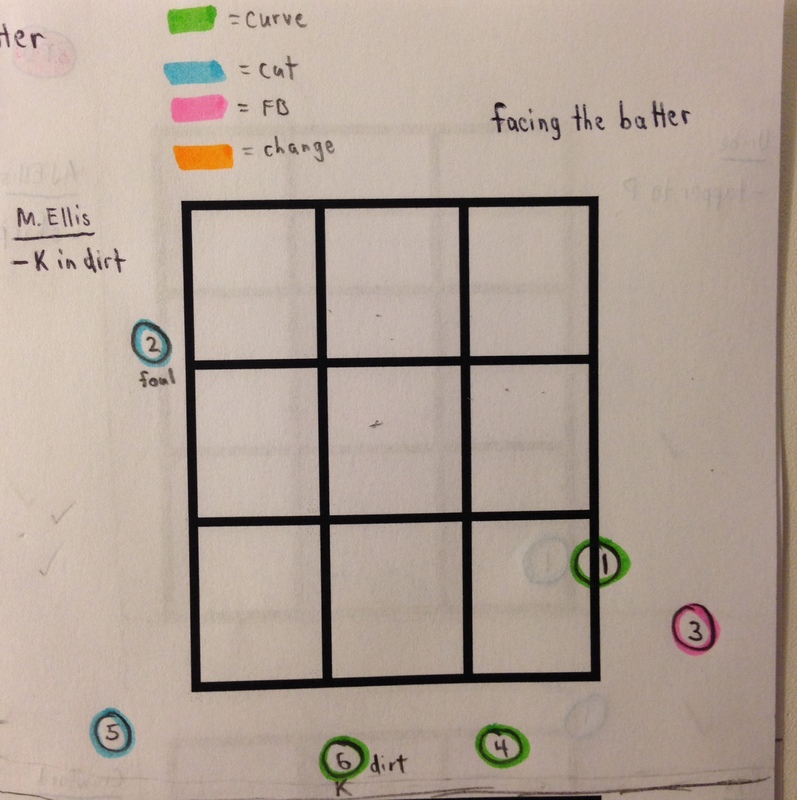 Predictably, we only had one disparity–I had one less cutter than they did–a pitch I classified as a fastball. Upon further review, they were likely correct which gives me confidence to continue to use their data in the future. As you can see, much of Wainwright’s pitching (84.6%) last night occurred either on the corners or on pitches out of the strike zone completely. This is crazy to think about considering he has recorded only 36 walks in 37 starts (regular season and postseason) in 2013. As you can see, Wainwright struck out a batter that strikes out in less than 14% of his plate appearances during his 11-year career on six pitches–with only one of them being in the zone and even this one was squarely on the inside corner. This sequence, along with the numbers in my table above, are a testament to just how nasty Wainwright’s stuff actually is out there on the mound. His curveball was dropping on average 6.42 inches last night. His fastball (4-seamer and 2-seamer) averaged 4.45 inches of tailing action. Lastly, his cutter (his second favorite pitch) had a perfect amount of late movement–breaking 1.61 inches away from righties and inside to lefties. Wainwright is really fun to watch. He is a master craftsman when he is on the mound. Hitting is already difficult, yet Waino makes it even tougher on hitters with the location and movement of each one of his pitches. To the fans that were only able to check the box score from last night’s game, it may appear that Wainwright got roughed up a little bit–allowing six hits over seven innings and taking the loss. However, I hope that this post was able to clarify things a little bit. He was simply fantastic. Finally, disregarding the poor defense and the base-running mistakes, if the Cardinals want to move past the Dodgers and compete for their 12th World Series title, the bats must wake up! I realize that the Dodgers have arguably 2-3 aces (Kershaw, Greinke, Ryu) on their staff, but averaging a mere 1.33 runs per game just does not get the job done–even with the fact that runs are scarce in the playoffs.